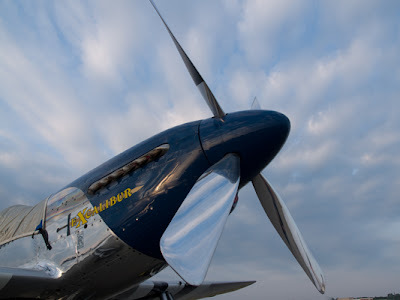 This is a shot of a P-51 Mustang taken at the 2007 Thunder Over Michigan air show held at Willow Run Airport in Ypsilanti, Michigan. 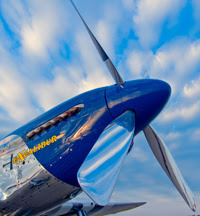 This show is held annually and proceeds go to suppor the Yankee Air Museum. In 2007, the featured plane was the B-25 'Mitchell' Bomber, but there were plenty of other vintage aircraft participating as well. Even though this shot was taken last summer, I hadn't really done much work on it. I liked the basic composition, but I wasn't able to come up with a finished image that I really liked. I took another stab at it recently, and the result is what you see above. The image to the left is what the image looked like coming out of the camera. I took this with an Olympus E-500 which captures images in a 4/3 aspect ratio. I didn't feel that the covered canopy and content on the right side of the image added much, so I cropped the image in Camera Raw before opening the image in Photoshop. As you can see, the original was in color. The shot was taken in early morning and we had some nice clouds in the sky. I liked the shape and texture of the clouds and I wanted to make sure that was retained in the final image. I also liked the glassy look of the plane and the propellers and wanted to maintain that as well. I tried several different types of post processing. I tried it in color, using curves to add contrast. I played with the color saturation and other elements. 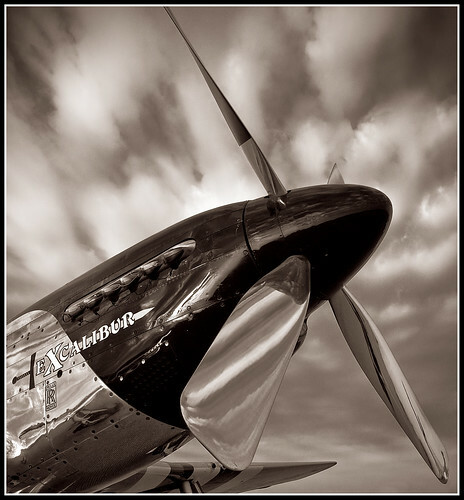 I finally decided that black & white worked the best, but had trouble with the bottom propellers disappearing into the sky. I decided to try an experiment where I would exaggerate some of the colors so that I would be able to lighten/darken them when I converted the image to black and white. In an attempt to have more control over the black & white conversion, I decided to see what would happen if I strengthened and enhanced the basic color before moving to black & white. Conceptually, I figured, this was no different than putting a colored filter on the lens when shooting black & white film, but with more control. The first image below was the result of converting the image to LAB mode and steepening the A and B curves. The second image was the result of manipulating the color balance of the image a bit more. The rest of the processing mostly involved working with curves or levels to increase the drama in the sky. I created a dodge/burn layer set to Soft Light and did a little painting on the sky to darken or lighten portions of the sky. I used a low opacity brush so I could have better control over the process. I then added a vignetting layer using the Lens Correction->Distort option. I didn't want the plane to be too dark so I used a masking layer to remove the vignetting from the plane and lower propeller. The final piece was to add a subtle tone curve to the image. 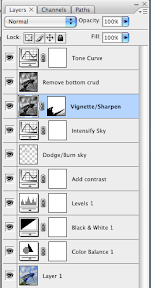 I reduced the opacity of this layer to about 50% to reduce the overall effect. Comments, constructive criticism and suggestions are all welcome. This shot was taken in North Myrtle Beach, SC where I recently spent some vacation time. The beach there is quite wide and firm at low tide and people like to ride bicycles on the sand. One vehicle which seemed really popular was a recumbent tricycle. 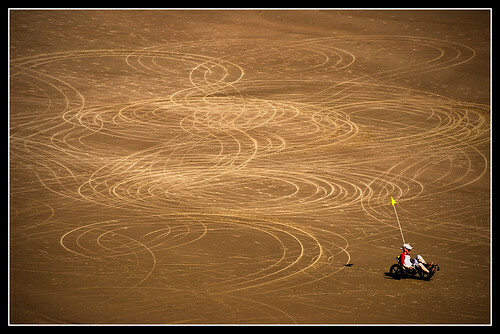 People really seemed to like to ride these things in circles, making interesting patterns in the sand. 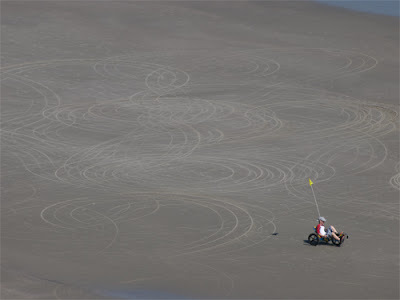 I was heading out of our hotel room to look for pictures to take and I noticed these two cyclists on the beach making some interesting patterns in the sand. Just as I was framing the shot, they decided it was time to move on. I had wanted to capture both cyclists as they were riding, but I was only able to capture one, just as he was leaving the edge of my composition. While I wish I had a shot of both of them, I am actually quite pleased with getting the one cyclist. I didn't really do much post processing work on this image. The raw image, shown here, was pretty flat and didn't really convey the feeling that I experienced when I saw the shot. The sun was out and it highlighted the tracks in the sand. The raw image doesn't really show that. Most of my processing was intended to bring out the pattern created in the sand by the tricycles. The first bit of work occurred in Adobe Camera Raw. I bumped the exposure a bit and brought the black level up a bit. This helped bring out more of the character in the image. I also adjusted the white balance to give it a bit more yellow. In reality, the beach sand there, when wet, was pretty gray, but I felt the golden tone suited the image better. Once I opened the image in Photoshop, I did some curves and levels work to increase contrast and further bring out the tire track pattern. I did a minor crop to eliminate a bit of water at the top of the image and the bring more attention to the rider and tire tracks. To finish the image, I added a bit of lens vignetting using the Lens Correction filter. Some sharpening and a simple frame create the image you see at the top. Labels: "North Myrtle Beach, "South Carolina", beach, lines, recumbent, sand, SC"